To ward off the negative energy unleashed by Nature and its possible repercussions on one's family's overall well being, the wise elders introduced the timeless tradition of every family reading the Ramayana as an oral, spiritual tradition. Thus, it goes without saying that for Keralites who embrace these traditions, the act of reading the Ramayana is as much a spiritual cleansing as it is a kind of tradition they can pass on to bond with their loved family members, particularly children. In the Ramayana, there is no 'preaching of principles' but you are taken through the Avatar's journey as a human being. 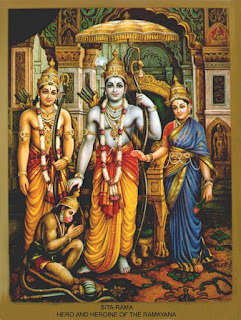 Lord Rama depicts how a man should uphold virtuous ideals no matter what the conflicts within a family may be. He exercises his choices and decisions in a way that upholds Dharma. For every home, the Ramayana is a masterpiece on family relationships, honoring what is good and preferring to suffer to preserve family honor than do the opposite for quick material gains. It teaches us what siblings' relationships should be like. It teaches a wife how to love, honor and respect the choices they make together as husband and wife. What makes the reading of the Ramayana a beautiful experience is that it brings families together and clearly demonstrates without preaching how to strive for the ideal relationship between a father and a son, a husband and wife, between sibling, and even between rulers and citizens. It also deals with other important topics like public administration, leadership skills, governance issues and so on. Typically, many people have a problem with the way Rama treated his wife, Sita. I don't want to approach the Ramayana as a cynic. For example, I read the Bible several times. I don't want to know or logically probe into how Jesus walked on water as if it were magic or turn water into wine. I want to approach the story of God as the glory of the Lord, the choices He made and interpret it in the context of its divine sankalpa. The logical men and women can scoff for their loss is theirs and mine is a spiritual gain. My purpose in undertaking sadhana is and has never been material. I take pride in remaining steadfastly anchored in being spiritual. As a child, I remember my grandmother reading the Ramayana in the evenings in the pooja room. A simple woman with tremendous spiritual energy, she didn't convert it into any specific ritual. She would make sure the pooja room was spotlessly clean, fresh flowers were plucked from the family compound and offered to the various forms of Gods kept there. And then she would light the brass lamps, sit down on a floor mat with the Ramayana book laid open and she would begin reading in her soft voice. Her voice had a poetic flow to it while she read each chapter and contemplated on the words. As the brass lamps glowed, I used to see a gold like radiance around her face during the time that she chanted it. Perhaps it was a sense of glowing peace that comes from reading a a text as spiritually profound and relevant as the Ramayana. I don't know. But her radiant face always reminded me of the glow that God's glory can bring to the face of a true devotee. After some chapters, if she was tired, she would stop it by offering namaskaram before the deities and then the reading would begin the following day. The way you chant the Ramayana is not as important as the feeling, or rather 'bhava' behind it. You may read it with technical perfection but if you are not able to feel that intoxicating love for the Lord, and feel the pain deeply again for the Lord, then there is no point in any elaborate ritual of reading the Ramayana. The reading of the Ramayana unleashes within you your own divine self and gives you an inner cleansing and divine energy that is dormant within you. So if you don't do it with all your heart, it is best not to do it at all. That is why the wise elders say that reading this holy text is the best way to attain salvation. By reading this text, by immersing yourself totally in it, you forget everything but the Lord's story and glory. For the first time in my life, I am going to read the Ramayana during the month of Karkidakam instead of listening to the story being told. There are several reasons why I have decided to do so. Firstly, my spiritual practices have slipped and been inconsistent this year, something that has not happened for years. For various reasons, I have not been disciplined about my sadhana. The monkey-like nature of the mind has played a dominant role in unsettling my spiritual priorities. Therefore, I want to make amends to myself by taking on a very disciplined spiritual journey that requires considerable attention to detail, contemplation and absolute focus on a daily basis. This reading of the Ramayana will ignite the spiritual repository that I have worked very hard to preserve and safeguard within. It is the very foundation of my purpose in life. As a spiritual seeker, I take my spiritual slippages more seriously than anything else in my life. If I miss a prayer because of indiscipline, I cannot forgive myself because it reflects the extent of how I value and honor my relationship and its roller coaster ride with my Divine Creator. Secondly, I want my son to hear me read the Ramayana daily. I may not be a good example to him or to anyone but I want to know that I tried lighting the lamp of spiritual curiosity in a child's mind. I will never force my beliefs on anyone but I know the answers to the questions a spiritual seeker usually seeks. And in children, their best questions are usually the ones that are toughest to answer. The reading of the Ramayana will ignite spirituality not only in the one who reads it but it will cleanse the environment itself and the minds and hearts of those who listen to it. By reading the Ramayana, I sincerely and directly serve the Lord Himself. Thirdly, I know I will make mistakes while reading it. I may slip at times in concentration or may fail to understand the significance of certain portions. But in every step that I take, I believe Lord Rama himself will take a hundred steps towards my faltering self. And for me, that awareness itself is like basking in bliss. Therefore, the unknowing mistakes I may make will be the grains of bliss and learning I derive from the act of reading the Ramayana. The Lord may not grant your wishes but on the spiritual path, if you falter, the Lord cannot watch on. He has to appear. He always appears to those who seek His love and grace. For the first time, I am going to invoke the name and form and love of Lord Rama. I am in a state of joy and bliss because I believe this journey is going to be a truly memorable one for me. May Lord Shri Ram bless us all to merge with the Lord through simple, righteous living. this year for north Malabar Karkkidakam begins only tomorrow the 17th. Nice and realy motivated me to start reading ramayana. I am not a spiritual person. But this post makes me think about something. Now I can see Ramayana as a story that gives moral stuffs to a person. Nicely written. Keep the good work. Looking forward to read what are the good stuffs you learned from Ramayana in future posts :). Thank you all for the warm, encouraging comments. @Harimohan: Your words mean a lot to me, thanks so much hari uncle. @sm: Glad to know you liked it. I look forward to more feedback from you. @Melange: When I wrote this post, I expected nothing, esp not this kind of caring, supportive feedback. I find it so personally inspiring that this post on Ramayana has been inspiring to many of you. It humbles me actually. @Hari KT: I am grateful to God that I was able to write about the Ramayana in the first place and secondly I am grateful to you all for encouraging me. In most write ups and even in social media, one sees a trend of making fun of the Ramayana or portions of it in the name of feminist thinking or feminism. So I wasn't sure any one in blogosphere would be interested in reading about my thoughts on the Ramayana.Your words and encouragement mean a lot to me while going forward with blogging. Many thanks. http://englishkambaramayanam.blogspot.in/ contains the entire Ramayana of Ezhuthachan typed in English with english meaning. THANK YOU P.R.RAMACHANDER SIR FOR INFORMATION. very nice & inspirational, great effort!!! !